A miter box is a great way to get kids started with sawing. It guides the saw for them and generally keeps the sharp cutting teeth out of their way. As with any woodworking, securing the wood being worked on is a crucial step in helping kids avoid injuries. I like this Stanley Miter Box for several reasons. 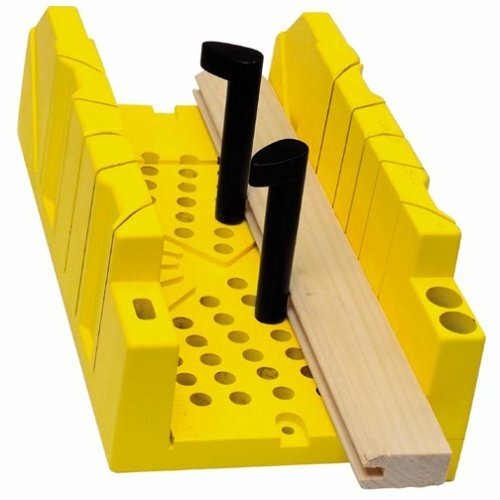 It has a series of holes with special pegs that allow even a child to wedge a piece of wood in place within the box. This means little hands don’t have to be in harm’s way. The height of the miter box is designed to keep the included saw from cutting into the miter box itself. Essentially the back brace on the saw acts as a depth stop and prevents it from cutting past the wood. The included saw works pretty well. As a child progresses or learns to use a pull saw, that could be used with this box as well. The only shortcoming would be that the saw would not be prevented from cutting into the bottom of the box. 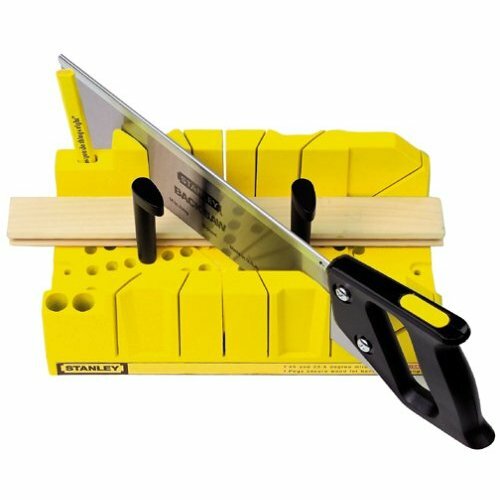 The Stanley Miter Box can be purchased either with the saw (Model 20-600) or without the saw ( Model 20-112). For the little bit extra (~$5), I got the one with the saw, for the depth stop feature.